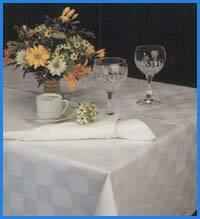 We offer bed sheet and table cloth in various qualities, width and sizes according to your needs. 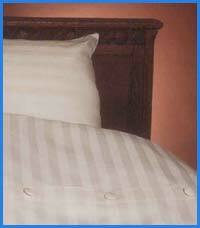 We offered various qualities of bleached white fabric for hotel bed sheet in both 100% cotton and polyester/cotton. 6. PILLOWCASE 20" x 30" x 6"
We can make according to your size specifications. 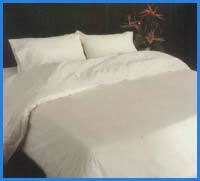 We can also offer duvet cover, pillowcase with flange (oxford style), mattress protector, bed skirt, etc. Please contact us for your specific requirement. We are currently making high quality 100% cotton satin fabric for table cloth. All our table cloth fabric are mercerize. The quality of the table cloth is very important because it has to be washed very often so we develop our fabric using fully combed double twisted yarn in the warp for durability and washability. Warp : combed cotton 40/2 Weft: carded cotton 16 Count (warp) : 100 Count (weft) : 60 We offer this fabric in width 64", 72", 90" and 110". Color available is white and any other color specified by our customer with a low minimum dyeing lot of only 500 yards per color.